How can you make the most out of an MBA admissions event? When it comes to MBA fairs put on by the likes of QS World MBA Tour, Access, Center Court, Forte, and P&Q, it’s not unusual for applicants to switch quickly into kid-in-a-candy-store mode. MBA fairs are an embarrassment of riches for resourceful applicants. But how do you get the most out of these events without getting option paralysis? For starters, it helps to understand what fairs offer applicants and what they don’t. “Each fair has an array of different offerings,” starts Hillary Schubach. “Some of them offer one-on-one opportunities to meet with representatives and/or alumni, and discussions related to the admissions process. 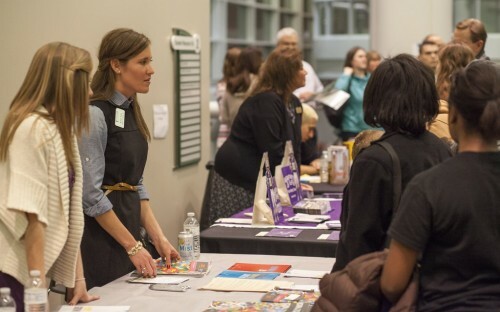 In addition, fairs “can be helpful as introductions to the different programs but are not really designed to facilitate in-depth connections,” believes Karen Marks of North Star Admissions. Doing your homework beforehand is essential. You must be able to demonstrate that you’ve “thought a little bit about your goals, that you’re prepared for business school, that you’re specifically interested in this school, that you’ve spent some time researching it, and you’re not going to waste their time,” adds Linda. Impressions are crucial: “Dress the part, bring a resume, and be professional,” advises Michelle Miller of Aringo. Bear in mind though, it is the job of the people to whom you’re speaking to do everything they can to sway you towards their school. Be wary of sales tactics. Which brings us to a wonderful nugget of wisdom from Paul Bodine of Paul Bodine Consulting/Admitify: curb your ambition. “Attending these panels and listening to admissions officers speak, at a minimum, gives you exposure to what different types of curricula, focus areas, teaching methods, and cultures are out there,” says Hillary. So, there it is, you just finished a whirlwind weekend at a QS World MBA Tour event—how should you follow up after it? Is An MBA Still Worth The Time And Tuition? How Do I Choose The Right EMBA Program For Me?